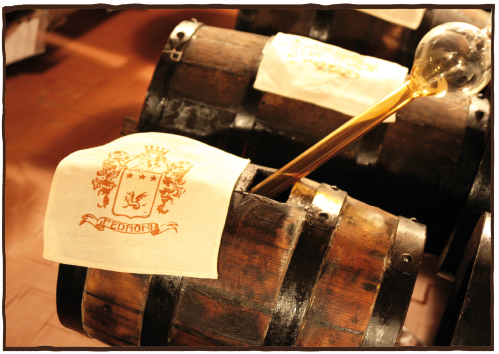 Thanks to the Pedroni Vinegar farm the old coat of arms of the Traditional Balsamic Vinegar from Modena is still alive. 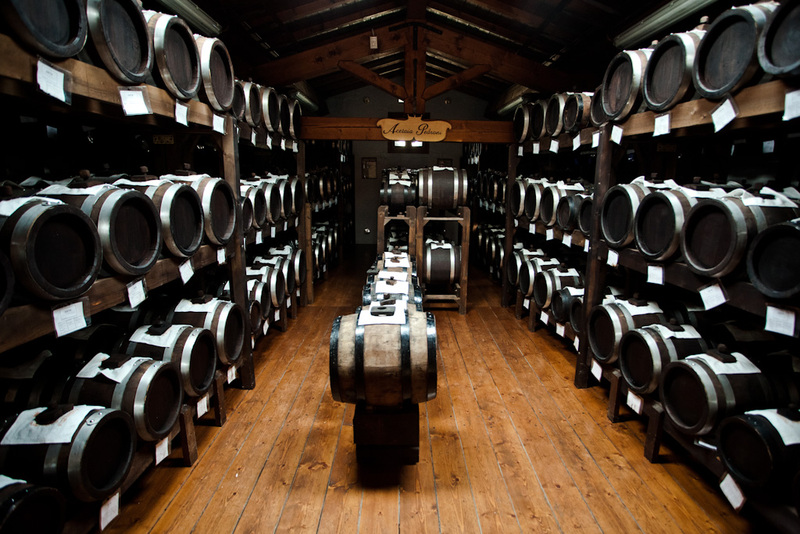 To write nowadays about the Pedroni traditional balsamic vinegar means to search back for tradition and practice handed down in the same family until today. From generation to generation with jealous passion. There fore we cannot help looking back to see what is left today of the genuine classic old “balsamic” acetification. So that a certain order can be followed, we will now focus our attention on the raw material chosen for the production of the “balsamic” vinegar: on grapes and in particular on “Trebbiano di Spagna”, since ancient times regarded as high quality grapes. Thus, being the decision taken by Pedroni accurate and carefully considered. This species of vine stems back in 1600. It is called “di Spagna” (Spanish) after the country of origin. After being imported and grown in these areas, it happened to find the right “habitat” and since then it has been telling about its tale of scents and sugar. On his journey back from Spain in 1638, the Duke of Modena, Francesco I d’Este, besides the decoration of “Golden Fleece”, took some hundred vine shoots of which he liked very much the final product : a sparkling, scented and pungent white wine which recalled him about his well-known “Trebbiano” produced in Italy in the uplands and flatland of his dominion. He tried and grew the vine and he managed. It was called “Trebbiano di Spagna”. These vine shoots came from the most important wine area in all Spain, the Jerez area and more precisely from the city of Trebujena (it was fated). This kind of “Trebbiano” made miracles. Its irregularly shaped and graped bunch with a high sugar content had such features to immediately prevail over the other wines. Just one flaw, a serious one, endangered its outliving : it was very weak in reacting against diseases and so it could never ensure an uninterrupted production. After the Second World War, this vine was not to be found any longer in the province of Modena. However, it could still be found in some “isles”. Among them, a true historic document, a small patch of vineyard in Rubbiara di Nonantola. Italo Pedroni inherited this patch from his ancestors along with the old Tavern. The old passion for the balsamic vinegar was still alive and so he understood the true importance, for his family vinegar farm, of that small and partly damaged but real vineyard which stretched out its old shoots just outside the window. And so, he began taking care of that vine again. He even managed to grow it larger and thanks to its grapes he still continues to have an extraordinary cooked must, main food for his casks and for the balsamic vinegar project. This sweet and dense must is kept in the same old “small casks” that his “ancestors” already selected for this use : first in oak and then in chestnut-wood casks. The final result is perfect - as a matter of fact this is a much-decorated vinegar farm on the harsh yearly competitions called by the Consorteria di Spi-lamberto for naming the best balsamic vinegar produced in the area of the ancient dominions of the Este family - and it also outstands for the accurate special touch that each producer gives to his work while carefully managing his vinegar farm and putting the precious cunnings that his family handed down from generation to generation into practice.